Type of rubber transmission belt excellent at low ground connection force, superior traction force. These track ameliorates the driving effect and expands usage in range of the agricultural machines and construction machines etc. Used in the mechanization of the basic construction. Driving and transport of farmland, desert, marsh field and other soft soil ground. 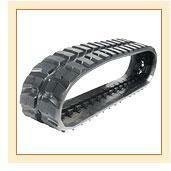 The track is a reinforced rubber belt with chevron treads for improved traction and reduced soil compaction. Having a rubber belt also means that the vehicle can relocate itself on public roads without damaging the road surface. These tracks on compact track loaders and excavators offer many benefits which in-fact compact track loaders and excavators with tires and/or steel tracks cannot offer. These tracks optimizes the traction system performance. The tracks also show power delivery efficiency. In straight pulling, the rubber tracks can develop substantially more force than rubber tires for the same weight of the tractor. With tracks, there are no pressures or weights to change and the tracks usually perform at their optimum. How to take care of tracks? Maintain the correct tension on your track. Check the undercarriage components like drive wheel, rollers, idlers for wear regularly. Try to limit the use of your vehicle on sharp rocky surfaces. Try to avoid too many fast and sharp turns. Try to prevent foreign objects from becoming entangled in the undercarriage. You should not drive with your rubber track sidewall edges pressing against hard walls and other objects. Clean your tracks regularly to prevent accumulation of oil or similar products. Usage of these track in applications such as rocky terrain, gravel, concrete demolition, metal debris, etc. may cause premature wear and failure of the tracks. When using rubber track-equipped compact loaders and excavators, the more careful an operator is, the better the track wear performance will be.